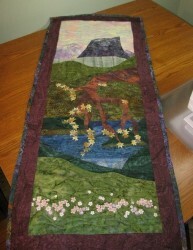 I finished my first landscape quilt Thursday night, in a flurry of hand-stitching. The binding, the hanging sleeve, and the label, the one that identifies it by its title, my name, and the date, all are sewn by hand. I was surprised at how quickly I could stitch all of it. Then, yesterday, afternoon, I took it, along with two other quilts I had made already, and hung them as part of a show of art quilts at Casa Nueva. I was so excited to be a part of the show–it had rather fallen into my lap. One of the servers at Casa is an art quilter, and she was organizing the show to coincide with the Dairy Barn’s Quilt National show–an annual juried art quilt exhibit where quilters from all over the world can show how they combine tradition with innovation, expanding horizons of the quilt as an art form. 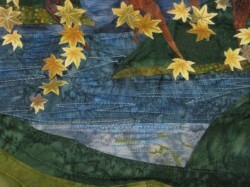 Here are a few photographs to show details from my quilt. It’s hard to see the stitching without looking closely. And it is hard to see the tiny moose button I added–I have it situated so that the moose looks like he is wading in the shallows across the lake. I was inspired by the traditions of Japanese landscape art–particularly the works of Hokusai–when I sketched out the design for this quilt. I always liked the way he made the human figures very small in scale, making them details in the landscape, not the focus of the landscape. That was sort of what I was doing when I added the moose–I wanted to give the feeling of a living creature in the landscape, who is there as part of the natural world, but isn’t the focal point of the piece. I hand-colored the Japanese maple leaves; they were originally greyish-brown and beige, so I added greens, a touch of yellow and highlights of orange and coral. I used Prismacolor colored pencils–after you use them to color on fabric, you iron over it, and this heat-sets the color and makes it permanent. The quilting on the branches was fun; I liked rendering the details of the bark in stitches–getting the feeling of rough texture with shapes that are by turns undulating and angular in lines that are very close together. I had a great deal of fun with the water; first of all, I layered three different hand-dyed and batik fabrics to make the basic shape and color of the lake; then I added iridescent blue oil paint in the form of Shiva paintsticks to blend the colors and add shimmering highlights. Then, using two different threads–a dark blue shimmering rayon and a heavier-weight cotton quilting thread in variegated blues, I quilted straight lines and zigzags to show the movement of wind on water. 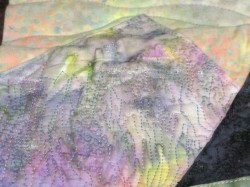 And then there were the mountains, which were actually the second part of the landscape I quilted. I loved making the look of rocky crags and outcroppings using multi-colored heavy quilting thread–it really made the mountains come to life. I had so much fun with this first landscape, I am inspired to make more of them. I love quilting in many different forms, but I had so much fun with this quilt–I worked on it intensely, a little every day for three weeks. I have an idea for another couple of landscapes–deserts, trees, mountains–and even some psychedelic, dream-like visions, and I can’t wait to start another one! 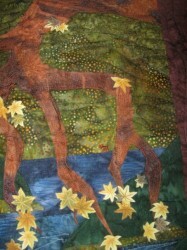 I’ll take a photograph or two of my quilts hanging at Casa and post them next week! For folks in and around Athens, they will be displayed there for the next month. And then, Marsha tells me that we are going to be hanging quilts again in July, so I want to make another couple of new pieces by then! Very cool. Makes me want to get back into quilting! It’s gorgeous!! You are so talented. Wow. Lovely! I’m reading the Elm Creek Quilts series of novels and it almost has me wanting to re-learn quilting. I just don’t think I have the patience to actually finish anything. I’ve been reading your blog for over a year, but lost track with my own work and travels. I’ve been reading through your latest posts and was sorry to hear about your health issues. We’ve been gluten free for almost four years. Love your quilt. Seems you have a way with fabric as well as food. 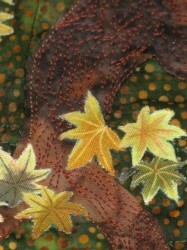 Susan machine quilted one of my quilts and her shop is one of favorite places. Now I’m imagining a quilt version of a Roger Dean album cover, and it is awesome. wow, that is a *lovely* quilt. That’s the most incredible quilt I’ve ever seen. Each one you do is more remarkable than the last. That’s really beautiful. Thank you for posting the photos! Wow – you did a great job. Those leaves appear to be dancing with the wind. The quilt is truly incredible. You are inspiring. I am not a quilter, but this makes me want to dust off my loom and get back into fiber arts. On an unrelated note, I’m sorry you once attracted the attention of a certain Mr. Averette. He used on post on another forum (before being banned) that I was once a regular at and he is a vile drug-addled sociopath, so you should be fortunate that his comment wasn’t even worse, or that things didn’t get worse from there. love your quilt, do you have any suggestions for the machine quiltting, i keep having trouble with threads breaking i have tried everything, one quilt will work fine, and then the next i will have to fight with for 3 days and then end up with a problem on the next quilt, getting really frustrated, do you have any ideas looks like you have been doing this much longer than i have. The threads breaking can have to do with several things, sherrie–it could be that you need to adjust the tension–probably your upper thread tension. Always start out with a new needle for quilting–sometimes a dull needle can cause thread breakage. The other possibility is that you are using different weights of thread in the bobbin and the top thread–some machines really don’t like you to do that unless you adjust the tension accordingly. If you are using all purpose thread in your machine for quilting, depending on the batting and fabric, it may not be strong enough for quilting. I always use quilting thread in my quilts–well almost always–and I tend to use YLI or the Coats and Clarks heavy cotton quilting thread that comes on large cones. I also use Mettler–which is more expensive, but it never breaks in my machine, no matter what I am doing with it. Also, if you are using monofilament “invisible thread” for your quilting–it can break easily. I personally never use the stuff because of that, though I know plenty of quilters who prefer it. I can’t stand the stuff myself, and won’t use it. Those are the most common causes of thread breakage in machine quilting–check all of those and see if that helps. Hey, Susan, you found me! That quilt is absolutely stunning. I’m amazed you did it all by hand!